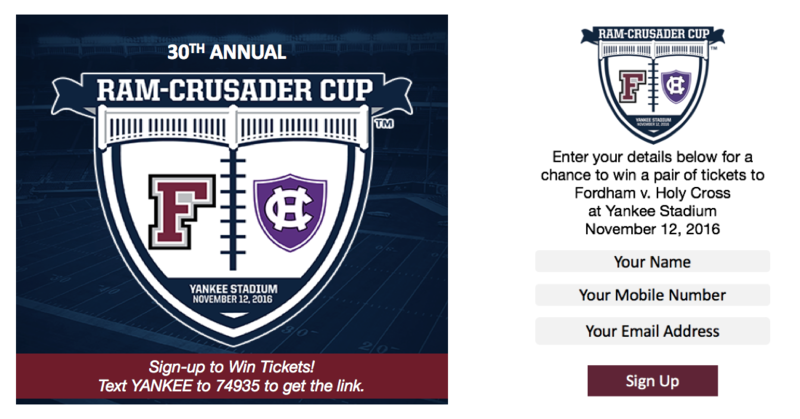 350,000 viewers watched on Twitter’s Live Stream and 21,000 people attended Yankee Stadium on Saturday night, November 12th 2016, for the Fordham vs Holy Cross Football: Ram-Crusader Cup. In anticipation of the game QWASI worked with the Univeristy Sports marketing teams and Yankee organization to create a mobile campaign that would drive Fan Awareness, Engagement & Ticket Sales. The solution devised was a ticket giveaway that was enhanced with Influencer Amplification. The following Mobile Optimized campaign was promoted by 3 prominent Fordham Sports Media Celebrity Alumni: Voice of the Yankees, Michael Kay, Voice of the Pac 12 Mike Yam, and CBS’s Andrew Bogush on across WFUV Radio, Twitter, Facebook, and Youtube. Direct mobile engagement with the campaign saw a 38% CTR to the ticket sales site. Social traffic hit 5000+ pregame engagement views with 5% leading to organic signups. Of the social sites Facebook attributed to 62% of engagement, Twitter 37% and Youtube 1%. The Fordham Celebrity Influencers and the WFUV Radio station were attributed with 89% of mobile engagement.